We are proud to announce that the United Kingdom Without Incineration Network (UKWIN) is featured alongside others, such as Friends of the Earth Senior Waste Campaigner Michael Warhurst and UKWIN AGM 2009 keynote speaker Peter Jones, in Resource Magazine’s “Hot 100”. 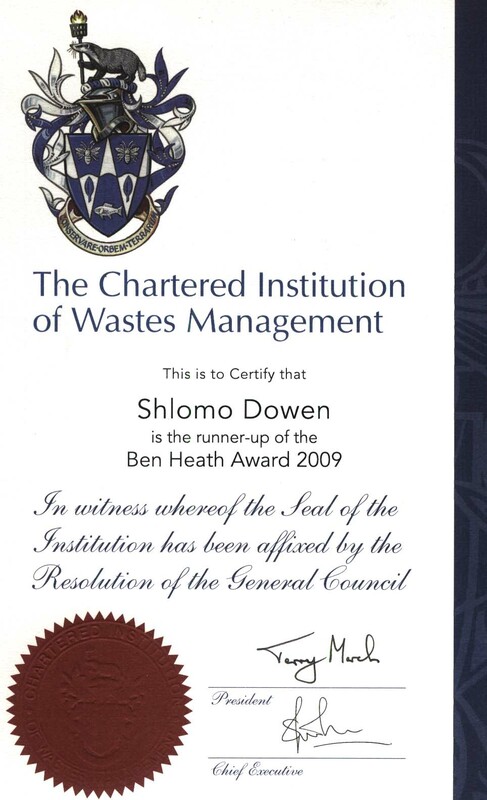 And as if that were not enough, UKWIN also received recognition from the Chartered Institution of Wastes Management (CIWM)! Each year the CIWM holds an award ceremony. The Ben Heath Award for Outstanding Presentations “is intended to recognise the importance of preparing clear, informative and interesting presentations, not necessarily involving the preparation of a formal written paper. This year’s runner-up for the Ben Heath Award for Outstanding Presentations went to UKWIN Coordinator Shlomo Dowen. Well done Shlomo and an excellent presentation with the strong arguments. For me it indicates that many in CIWM quietly agree with the waste resource /contra incineration points you make.